April in the Pacific Northwest starts clearing the clouds, bringing sunshine and warmer weather. With thoughts turn to spending more time outdoors, is your outside living space offering you the same entertainment options you have inside? Let’s explore some audio and video upgrades you might want to consider to spice up your outside entertainment this summer in your Lake Oswego OR home. You might be surprised to learn that you can have great audio quality outside too. Enjoy music that can set the right ambiance and mood for a variety of activities – indoors and outdoors. There are more options than just portable Bluetooth speakers for your outside living space. While those are convenient and simple, they may not have the quality or output that you would like outdoors. Sonance is a brand well known for its architectural indoor speakers. But they also have several outdoor speaker lines. The Sonance Landscape Series (SLS) employs below ground subwoofers and satellite speakers to deliver rich sound which is heard but not seen. Similar to the SLS line, the SonArray also offers a series of hidden subwoofers and speakers that can cover an outdoor area of up to 2000 square feet with high quality, seamless audio. They also offer above ground rock speakers – which look like rocks – that can blend into the landscape. Naturally, all of these are virtually impervious to the elements. Control4 is known for their home automation and control products, but they also recently introduced an outside speaker system. The Triad Speaker Array offers a subwoofer and satellite design, and their construction withstands extreme heat, cold, and humidity. A defining feature of the speakers is a wide 150-degree dispersion of sound, which helps to spread sound evenly in an outdoor area without having to crank up the volume significantly. There’s more than sound that you can bring to your patio or yard. How about movies, shows, or sports on a big screen like your home theater? Advances in screen materials and projector technology now let you take your theater experience outdoors. 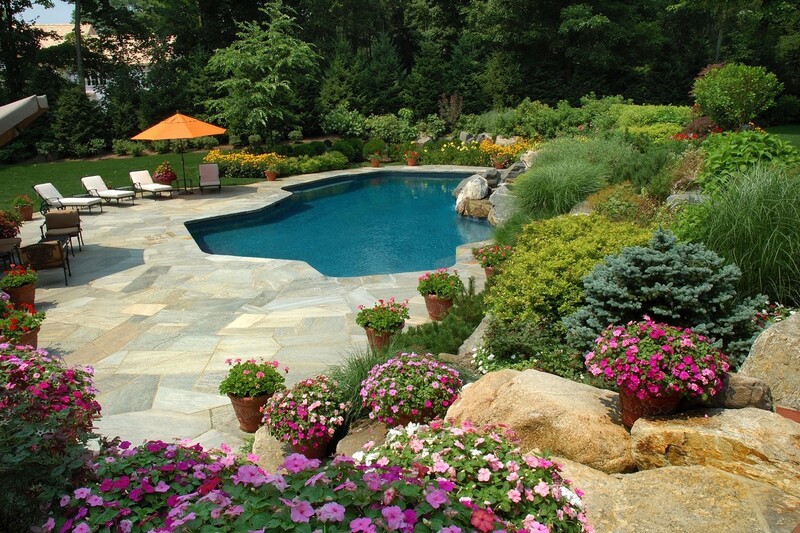 Imagine lounging in your pool or patio this summer and enjoying a movie or sports event with a large group of friends. You can make that a reality. Stewart Filmscreen is well known for their high-quality home theater screens. Their Oasis Electriscreen is a motorized, retractable, weather-resistant screen that is designed to be used outdoors. It can even be customized to your needs including size and aspect ratio. Pair an Oasis screen with a portable Sony projector or go all out with a Digital Projections model, which can offer fantastic brightness and resolution in an outdoor setting. Combine your show with the superior audio emanating from your outdoor speaker system, and you may spend a lot more time outside this summer. Employ a Control4 system, and you will be able to control the whole show with an app on your smartphone, including coordinating the outside lights. The possibilities outdoors may be limited only by your imagination and budget. To find out more about how we can transform your outdoor entertainment in Lake Oswego, reach out to our team today!